Prosecutors in Northern Ireland have insisted it was in the public interest to bring a case against a woman found guilty of buying drugs online to abort her unborn child. An abortion in such circumstances is against the law in the region and the woman claimed she was unable to raise enough money to travel to England to access a lawful termination. She miscarried a male foetus, aged between 10 and 12 weeks, after taking two types of abortion pills she purchased on the internet in 2014. Two of the woman's housemates reported her to police after she aborted. The 21-year-old, who cannot be named due to a court order, pleaded guilty to two offences under Northern Ireland's abortion laws and was handed a three-month jail sentence, suspended for two years. The sentencing judge told the court in Belfast on Monday that the legislation was 150 years old. Abortion drugs can be accessed in the rest of the UK, but should be taken under medical supervision. The maximum penalty for the crime of administering a drug to induce miscarriage under the relevant law in Northern Ireland, namely the Offences Against The Person Act 1861, is life imprisonment. Across the border in the Irish Republic, the offence of procuring an abortion carries a potential 14-year jail term. The case has sparked a fresh row about abortion laws in Northern Ireland. Both sides of the ever divisive debate have criticised the outcome, though for very different reasons. While pro-choice campaigners have denounced the prosecution, pro-life advocates have insisted the sentence was too lenient. The Northern Ireland Public Prosecution Service said the case met the evidential threshold and its pursuance was in the public interest. "The test for prosecution has two elements," said a PPS spokesman. "It involves an assessment as to whether the available evidence provides a reasonable prospect of conviction - and also whether prosecution is in the public interest. "In this particular case it was decided, having carefully considered all of the relevant evidence and information, that both elements of the test for prosecution were met. A range of factors were relevant to the balancing of the public interest, including the important fact that the law in Northern Ireland makes the conduct in question a serious criminal offence in respect of which a conviction carries the potential of a significant custodial sentence." Amnesty International said it was "appalled" by the conviction. Amnesty's Northern Ireland director, Patrick Corrigan, said: "A woman who needs an abortion is not a criminal. The law should not treat her as such. "This tragic case reveals, yet again, that making abortion illegal does not stop women in Northern Ireland needing or seeking terminations. "Those who can afford it travel to England for the treatment they need - over 1,000 women make that journey from Northern Ireland every year. Those that can't afford it, as appears to be the situation in this case, may take medication in an attempt to terminate their pregnancy - without medical supervision or support." Pro-life campaign group Precious Life has called for an appeal against the sentence, alleging it was unduly lenient. 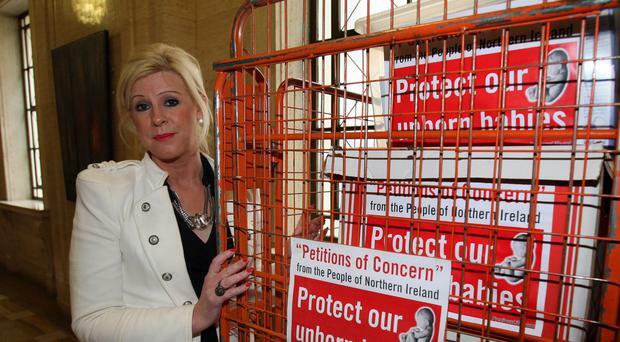 Precious Life director Bernadette Smyth claimed the judge had seriously undermined the legislation. "The woman in this case accepts that she committed a crime by procuring her own abortion by purchasing abortion pills online," she said. "Precious Life is very shocked that this judge's sentencing was so manifestly lenient in respect of such a serious crime, and is very concerned that this court judgment could set a very dangerous precedent for similar cases." Ms Smyth said her group would be writing to Northern Ireland Attorney General John Larkin and Director of Public Prosecutions Barra McGrory in an effort to have the case referred to the Court of Appeal.